Angstrom wrote: There are some things in Ableton Live that I think only three people know about. 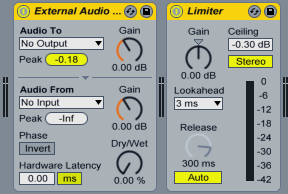 Why does your ableton live looks too very well? Use the Scale in EQ Eight to work transitions out (e.g. 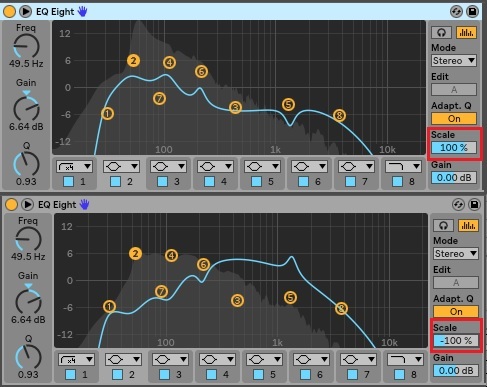 in the kick drum) and duplicate the EQ Eight (e.g. to the bass), set the Scale to -100% and you perfectly reduce the freguncies which you make bigger in the kick drum. Great for making sounds works together! Necrojacking Steve's thread from 2004. Love it! There are peak level meters in session view, but they are limited to track output, and there's none in arrangement view. Note: Ableton peak level meters ignore weak signals (-120db or so). Note 2: due to how External Audio works, it introduces a delay that is equal to audio device input+output buffers. Depending on the project or audio device settings, may be unsuitable to have it permanently in the chain. Last edited by Exie on Sun Jun 03, 2018 10:59 pm, edited 1 time in total. Exie wrote: There are peak level meters in session view, but they are limited to track output, and there's none in arrangement view. I enjoy it as well. The important thing I forgot to mention is that it introduces a delay. Not a big deal if you don't have latency problems but should be kept in mind. I usually drop it sporadically to a track for a check and then remove when I don't need it. Exie wrote: I forgot to mention is that it introduces a delay. Not a big deal if you don't have latency problems but should be kept in mind. I thought this video was truly intuitive. It's very brief, and teaches you how to use the chord tool and the arpeggiator tool in Ableton (don't know which version, but both are featured in 10 Suite and in the video). Very useful video for making some EDM sounds! EDIT: I guess I'd better insert the link to the video. How about automating Live sessions? Using Next/First/Start etc, using these to create endless sort of modulations? Feels a lot like VCV Rack. Valiumdupeuple wrote: I think I have a big one. I use Live extensively for years, but I just discovered this one. Sorry for those who already know this one, it just changed my life, it's especially useful for sound design/ sound editing to video. you have access to the volume and the transpose of the SELECTED clip, not just the one you've mapped. Of course you can save the mapping within your default set, and without the need to have a clip in it just for the mapping. Just put a clip in a track, go to its clip view, midi map. You can now delete the clip. Check with a cmd-m... the mapping is still here! One less mouse action needed, audio editing goes sooooo much faster. The image link showing how to map volume and transpose is dead. An anyone assist? I think it refers to simply MIDI assigning (ctrl+M) the Clip Gain slider and Transpose knob in any Audio Clip to a knob in a MIDI controller. It will work for any Clip you have selected, not only that single Clip. pottering wrote: I think it refers to simply MIDI assigning (ctrl+M) the Clip Gain slider and Transpose knob in any Audio Clip to a knob in a MIDI controller. It will work for any Clip you have selected, not only that single Clip. Group an instrument rack together for easy panning! Group the Broken Hi-Hats redux and your normal hi-hats (create a new chain) and lower the wet to -25.0. It makes for great energy to hi-hats! I am Grid, the last being you will ever see.